Around here, "swap" refers to the practice of trading unwanted items, rather than disposing of them. Or, the practice of getting the thing you really want, without exchanging any funds. It's pretty amazing. People find everything, from furniture to baby equipment to clothing to shoes to tools. While we practice it via text stream as often as we can (anytime you think "I can't keep this anymore..."), we also make a formal event of it once a year: The Neighborhood Swap. 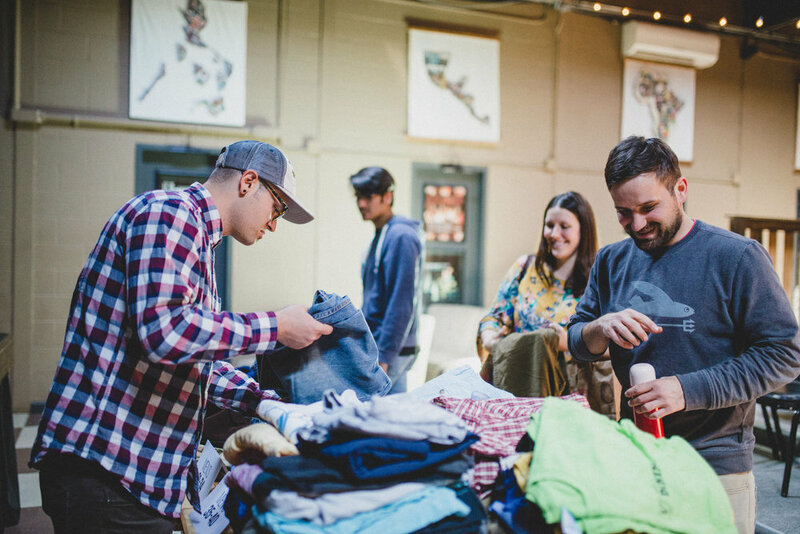 Herein lies the story of our 2017 Neighborhood Swap, broken down into simple steps in case you want to try this one at home. First things first, if you want to swap, you gotta have friends, or neighbors, or friends that are neighbors. It's easiest to love your neighbor when you know them, right? When people get around free stuff, they go crazy. Remember Black Friday? Point made. So, if you want the swap to not be full of greed (even the tamed, passive Christian kind), you'll need to welcome some spirituality into your moment. On Sunday, Brett Madron spoke out of Ephesians 5:15-20, with Paul's words to not be foolish, but "consider how we walk." His sermon tied in well with the heart behind the swap--to consider our "time" (a time of excess), and how we should be wise in the midst of it. He encouraged listeners that doing the will of the Lord is an active pursuit, and that thanksgiving plays a major role. He clarified that thanksgiving isn't just a feeling, but is an expression spoken that can even encourage others. That spirit seemed to characterize our communal lunch together, where you could feel the gratitude and uplifting words around you. You also are less likely to sin if you just ate (I'm pretty sure that's a fact). We were blessed that the great folks at Califarmia Food Truck came to our property to offer delicious lunch options to all of our Bible Study attendees. It was again, notable, that though the whole building is filled with FREE stuff, people were enjoying their time, talking to one another over their tacos, cubans, and fresh made raspberry lemonade. Over 20 individuals volunteered to work at the swap this year. If you saw the amount of clothes dropped off the day before, you'd know this was no easy task. Swaps can only work successfully if they are organized, and volunteers like Hannah Duffy and Michelle Madron made sure that was the case. From sign in sheets to track the number of people who benefitted, to bags for those who, like me, forgot--they were on top of it. Items were sorted by size and gender, with more volunteers organizing throughout the swap to keep the totally-would-be chaos at bay. It was amazing to watch. This principal guided us in the standards by which we sort our unfortunate excess. What we aren't going for is piles of things that no one would want, ever. So, no stained, ripped, unintentionally holed, or broken items are allowed. The volunteers sorting items were strict on this! 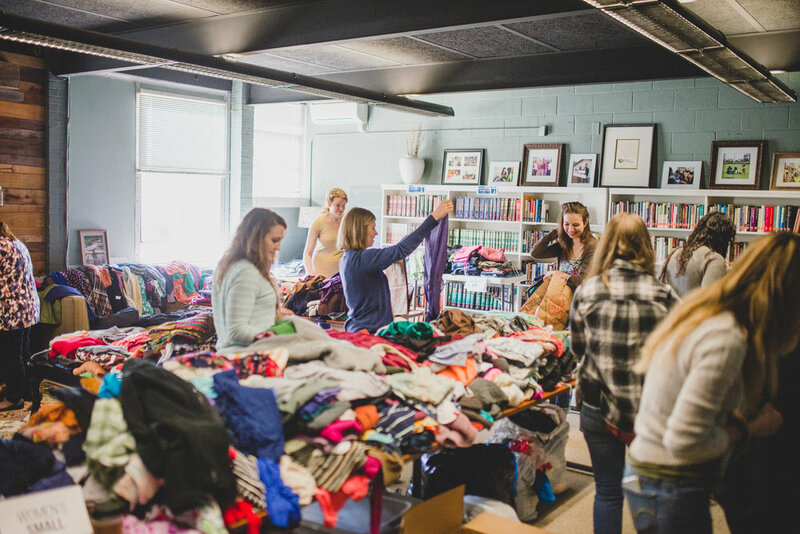 This policy kept participants in check by not just seeking to purge our closets and get all the stuff out because it feels good, but by instead having to consider each item and whether or not it could meet someone's need, or want. Because we do this event regularly, it becomes something that people count on. Corey Foster, a teacher at the Academy for G.O.D., is awesome at loving her neighbor in this way. Every six months she takes a look at her closet and removes anything she hasn't worn in those six months. She either gives them to someone she knows would enjoy them, or saves them for the swap. "I'm thankful that my good but unneeded items can be gifted to individuals or families, who then don't have to spend any money on them. It's such a gift to take care of one another in this way." My favorite part of swaps the last few years has been witnessing friends say "this is your size, you should try it!" or "Oh man, this looks just like you!" When you're looking out for one another, and not just yourself, this big room of free clothes can actually be an enjoyable and intimate experience to learn what your friends think of you, or what games they can come up with to dare you to try something outside of your normal repertoire. Then you'd hear the questions go even broader: "what do you think about this dress for Annette" (a cooperative of G.O.D. in Uganda). Or others on a specific mission: "Let's find all of the yellow shirts for the women in the Tacloban jail." At this jail in the Philippines, women are only allowed to wear yellow. But in often overcrowded conditions with scarce access to hygiene products or water, a fresh yellow shirt is one of the most welcome gifts we can bring. It's two different things to supply clothes to people in poverty, and to consider their size, and climate, and style and act as a personal shopper for those you care about. The latter is quite the privilege. You could sense it when you saw a point person from each of G.O.D. 's international regions with a organized checklist of sizes and names, checking tables and considering their friends across the globe. 7. Distribute to others in need. If this is starting to sound like a long, drawn out plan to stop committing the sin of American excess, it is. As Americans, it's hard to even be able to stop having too much. You may think you have "just enough," and then the holidays hit. Grandma comes to visit. Things go on sale. Someone bought you a "just because." All of a sudden, it's hard to close a drawer again. 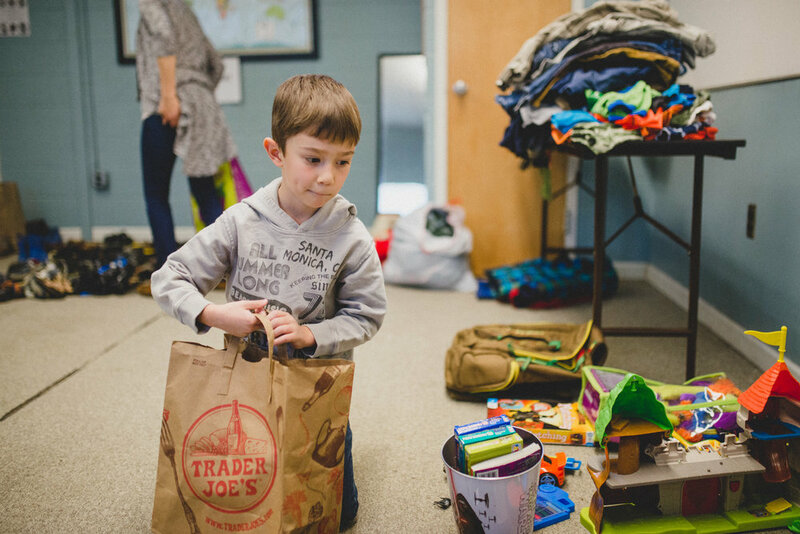 While swap is a wonderful thing to help meet needs for many people, it is also a way for those of us with too much to intentionally balance the scale. The only problem though, is that there is still plenty left over. After we provided goods for 300 people at the swap event, we had a classroom full of stuff left over. Finding more people to bless becomes the final mission, and takes serious commitment to see through. 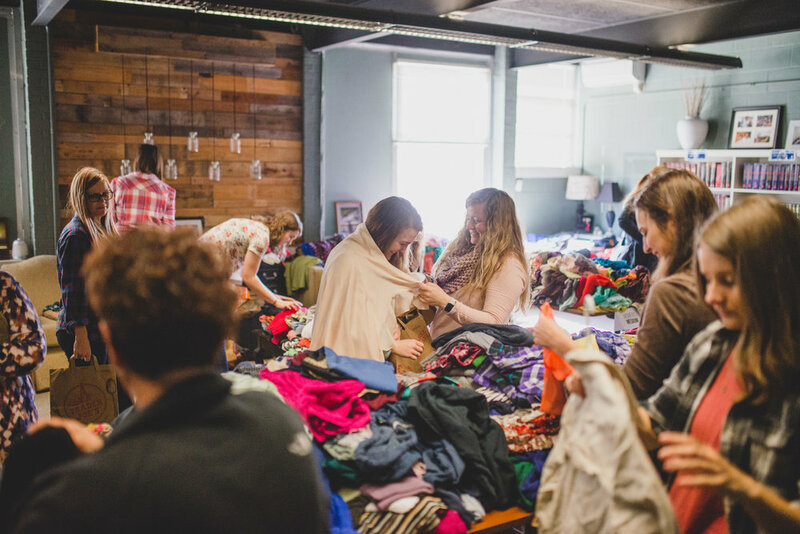 We could have just taken the extras to a secondhand store, but it didn't feel right--not with our awareness of so many people in need. But, even as a development organization, we can only take so much luggage abroad. So, we reached out to Nashville refugees. We gave them receiving blankets, car seats, and as much clothing as they liked. But there was still more. When we phoned our friend, Pastor Martin, a Sudanese pastor, he informed us that his church had what they needed too. But, he was more than happy to tell us about his church's regular mission to send necessary items to Internally Displaced Peoples camps in Northern Uganda, where Sudanese refugees have been living for decades. This church sends shipping containers to their contact in the IDP camp and a children's home, which serves 60 children. 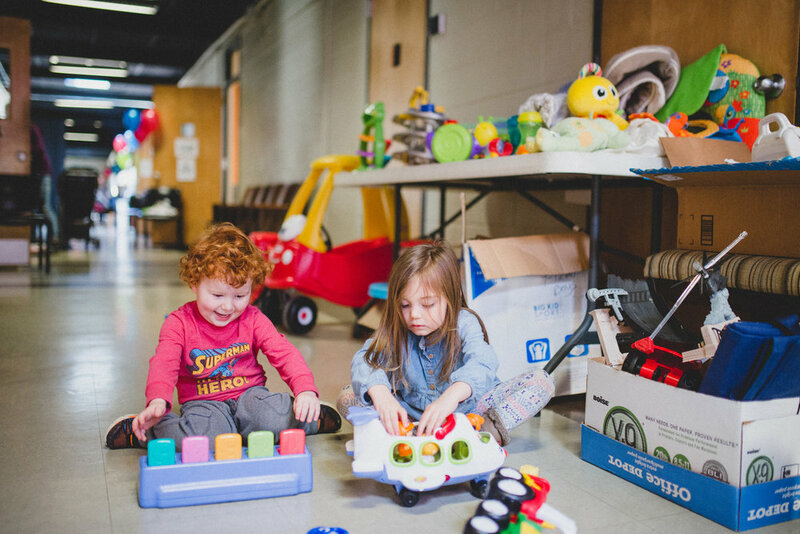 This year, these IDP camps are the final destination of swap items, and we couldn't be more happy with it! 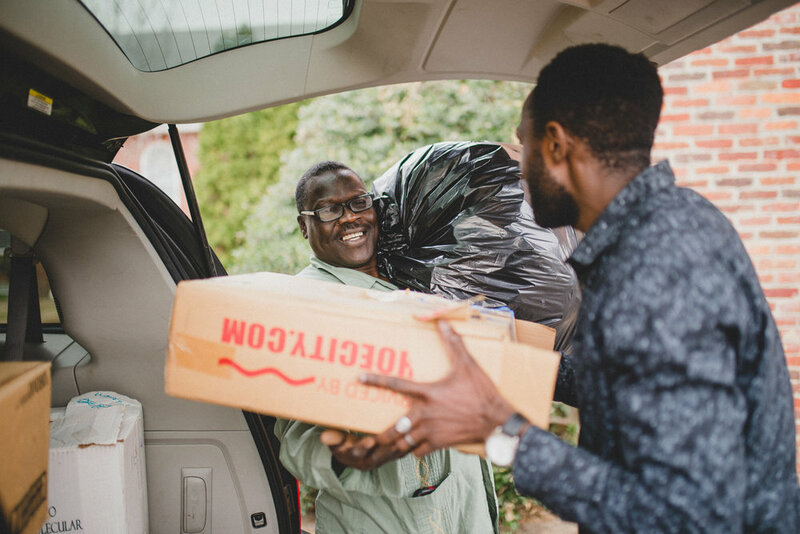 We were thrilled to be able to fill their container with quality clothing and necessary items for some of the world's neediest and most vulnerable people. John Nyago explains, "the situation for Sudanese refugees is vast, with many of them not being able to afford basic necessities. I am very happy that we have been able to share our clothes with them. It is a huge blessing." James 1:27 tells us that true religion looks like this: caring for the world's most vulnerable and not being stained by the world. Stains take a concerted effort to get out. In our generation, one of those stains is excess. I'm so thankful that my friends and co-laborers in this community not only make efforts as individuals to cleanse themselves from that power, but they also do creative, communal-wide organized events to make it easier for others to do so as well.